The computers in the library’s open computer labs are available on a first come, first serve basis. Lab computers are equipped with a wide variety of software utilized by courses at MWCC. All users will need a login and password before using the computers. Community users can have a login created for them at the Circulation Desk if they have a public library card. The following policies, as well as the MWCC Information Technology General Acceptable Use Policy, and all local, state, and federal laws apply to all library computer users. Users of the library’s computers are expected to use online resources in a responsible manner that is consistent with the educational and informational purposes for which they are provided. Any use of the library’s computers for unauthorized, illegal or unethical activities is prohibited. Users must obey all applicable laws regarding copyright or licensing. Users must not make any changes to the setup or configuration of any software or hardware. Misuse or abuse of the computers or internet access may result in a suspension of computer privileges. The following is provided as an addendum to the MWCC Information Technology General Acceptable Use Policy. The library staff reserves the right to restrict use of the computers if people are waiting. 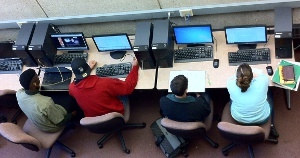 Priority use is given to members of the Mount Wachusett Community College community (students, faculty and staff), who are using computers for academic work. As per the MWCC Information Technology Acceptable Use Policy, it is not acceptable to use the library’s computers to send, receive, or display text or images which may be reasonably construed as obscene or objectionable. Library patrons may report any incidents of the display of inappropriate material to the library staff. MWCC students, faculty, staff, and guests of the college are responsible at all times for the children they bring to campus. Children under 16 years of age are not allowed to use Library computers unless they are an enrolled student. Anti-virus software is provided on all terminals in the open labs. The MWCC library is not responsible for any damage to a user's disk or computer, loss of data, or liability that may result from the use of the library's computers. The College recommends emailing documents as the safest way to save any work or downloaded materials. All the computers in the library print through the PaperCut print management system. Instructions for printing are available in the library. Printing costs 10¢ per side. Anyone using an application which has sound will need to use headphones. Headphones are available for loan at the Circulation Desk on the main level with a valid student ID/library card. Wireless Internet access is available to all users. Students, faculty and staff can choose EDUROAM in your WiFi settings.Guests can choose MWCC WEB LOGIN.